Although your automatic garage door adds a lot of conveniences and security to your daily routine and your home, it is still a large electro-mechanical system that needs to be treated with the proper respect. There are all sorts of accidents that can occur due to neglect or unsafe behavior, and unfortunately, a lot of them can end with a serious injury. That's why you need to follow some basic guidelines if you want to avoid a lot of dangerous scenarios. The opener is the device that makes your door become automated. We often take for granted how easy and convenient this device makes our lives, but we must never forget that it can be dangerous too. When you first get an opener installed, you need to make that its wall switch is placed somewhere high enough where a small child won't be able to reach it. The remote control is another potential issue, and it should be kept either as part of a keychain or somewhere safe that isn't easily accessed by anyone other than an adult. Children don't always understand the dangers some things pose, so it's up to you to make sure they're kept out of harm's way. Even if you consider yourself to be an expert handyman, your garage isn't the place to prove it. All sorts of DIY repairs can be extremely dangerous, especially when dealing with things like the cables and the springs, not to mention the opener. There is a lot of tension involved in the operation of your garage door, so unless you have all the necessary tools and you've undergone the required professional training, you should never try to handle a problem by yourself. That's what professional technicians are for. You may ask yourself, "so if I can't fix things by myself, what can I do? ", to which we answer - quite a lot, actually. Vigilance is a major aspect of avoiding accidents, and even something as simple as examining your garage door on a monthly basis can go a long way. The earlier you spot an issue, the sooner it can be addressed and resolved. This will prevent more complex problems from developing, which will reduce the potential risks. You can also lubricate your springs and rollers every so often in order to increase their working efficiency and reduce their wear and tear damage that's created as a result of friction. If you find yourself facing some type of problem, don't hesitate to contact our team at Garage Door Repair Auburn right away. 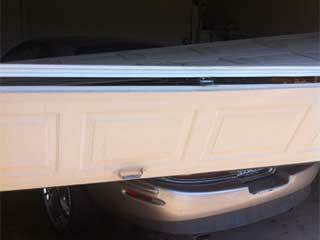 Every local homeowner who needs some help with their automatic garage door can count on our company for assistance. We have over a decade's worth of experience fixing and installing overhead doors of every major brand, and our technicians follow strict guidelines in order to ensure the best possible results. The rest of our website has a lot of useful information, so feel free to check it out. Thank you for choosing Garage Door Repair Auburn! One of our experts will be in touch soon. Feel free to browse our website for FAQ, tips and more useful information in the meantime!